I checked the synopsis here and I was wondering about the genre of parody. 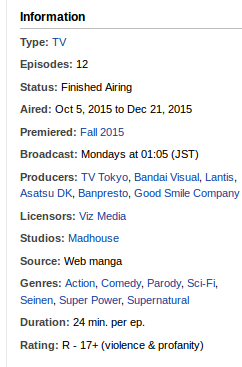 I’ve completed the season of One Punch Man and there was no parody of anything in the animé. The only parody animé I’ve experienced before is Gintama and the parody is altogether at another level! Whereas, One Punch Man had relatively none. Am I missing something or is it an error? TL;DR: One Punch Man is not a parody of a single manga, it is a parody of the whole shonen genre. It makes fun of its codes and therefore can be seen as a parody. To help understand it, I will compare One Punch Man to Dragon Ball. I will use the anime for comparison, but it is pretty much the same for the manga. This can and should be applied to many shonen series and not only Dragon Ball. Its use is only intended as an example. Saitama fights because he just wants to be a Super Hero. Being a hero is considered a hobby for him. On the other hand, Goku fights because he wants to save his friends and the Earth, while Vegeta fights to become the strongest fighter ever, Gohan wants to save the Earth so he can study peacefully, and so on. One Punch Man is deconstructing the shonen hero goals: by reading/watching it, you have the feeling that anybody can be a hero, it's not that hard. This is going even deeper as C-Class heroes are quite casual people. As mentionned in this post, compared to the power he acquired, Saitama's training is just ridiculous, and it is even more so if you compare it to the training in other anime. There are a lot other things that could be mentioned, such as the fact that we see the hero doing casual things (groceries, eating in restaurant alone, ...). As others said it pokes fun at the action/fighting style anime (and potentially a few others). It even parodies some specific characters from those kind of anime. Lord Boros: Based off of Broly from Dragonball Z, a character whose fans think he is the epitome of power. Garou: Could be several characters but I find him to actually be based off of Doomsday from Superman. I say Doomsday because Garou was initially a monster and could not be killed. He just kept coming back more upgraded, just like Doomsday. And there are many more. Just re-watch the series and take note of each character. It's amazing how many characters there are parodies of from their personalities to their resemblance and everything in between. I would assume, that, the concept itself, of a character that would immediately vanquish any foe, no matter how tall, strong, heavy, experienced, etc, with just one punch, would obviously be intended as the ultimate parody, in itself. My only real question would be: when the OPM video game is released, does OPM simply throw the punch, or, is there a fourteen button sequence that needs to be learned? Another thing to consider would be when someone is talking about their backstory or how powerful they are. In Shonen, characters seem to drone on about themselves and OPM tends to get bored of it and interrupts them to get to the point of their interaction. He has the attitude of "shut up and let's get to it" because he'd rather just get it over with and go on with his day. What is the source of Saitama's enormous power? Why Saitama doesn't want to unleash his full power?